Bernard Cornwell has written over 55 novels and sold more than 20 million books worldwide. 20 million. Just let that sink in. He’s one of my favourite novelists. I devoured the Sharpe series and am now into his Uhtred Saxon/Dane epic. UK appearances are rare as he lives in America. So I jumped at the chance to see him give a talk in York. Here are just a few quotes I managed to scribble down. “You write what you want to read.” In Bernard’s case, he wanted to read Hornblower on land. He says it takes him three months to write a book, then three months to edit and carry out additional research. I was amazed given the brilliant twists and turns of his books that Bernard is a ‘By the Seat Of Your Pants’ter, rather than an organised plotter. But: “I spend a lot of time putting doors in alleyways.” So if Sharpe gets caught in a situation, the solution appears. But that solution has been hinted at earlier. Sharpe was originally meant to be played by Paul McGann. However he injured himself playing football with the cast. Apparently it was the biggest insurance claim in television history. Sneaky insight: there will probably be three more Uthred books after War Of The Wolf. Bernard doesn’t relish providing jacket blurb for historical fiction. For fun, he’d rather read a good police procedural. However he does like George MacDonald Fraser, author of the Flashman series. I was delighted when Russell from the Jorvik Viking Centre asked if Bernard would ever write about the English Civil War. I know Bernard says he hates writing jacket blurb, but maybe he’d make an exception for my Royalist spies undermining Oliver Cromwell in the Interregnum? As you would probably guess, Bernard is a natural storyteller. He has a great turn of phrase and is so warm and engaging. 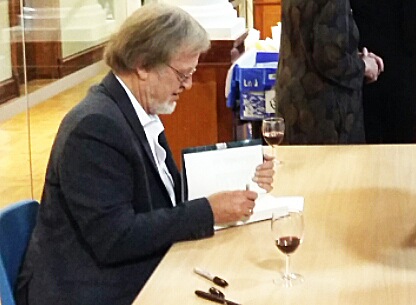 Afterwards he must have signed 200+ copies of books for his adoring fans, including myself. Cape Cod and Charleston are very lucky to have him. If you ever get the chance to hear him speak, go! P.S. He is a patron of FirstLight Trust, a charity who supports veterans. He’s given permission to call their charity cafe hubs Sharpe’s cafes.